THE TALE OF SNOW WHITE Next in Little Kids on Stage Series! 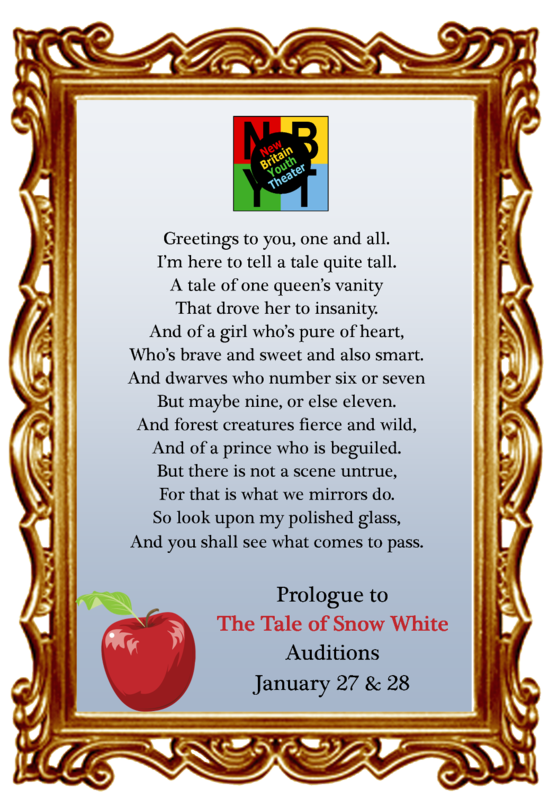 NBYT will audition children ages 6 through 9 for The Tale of Snow White on Monday, January 27, and Tuesday, January 28, 2014, at Trinity-on-Main Performance Center Annex at 19 Chestnut Street in New Britain. Audition times both days begin at 6:00 p.m. For children cast, rehearsals will be held on Mondays and Tuesdays. The production will be performed in Stockman Hall at Trinity-on-Main on April 11, 12 and 13, 2014. The Tale of Snow White, written by NBYT Artistic Director David B. Sousa, follows the classic fairy tale with some exciting additions. As introduced in the prologue to the tale, roles include Snow White (who’s “brave and sweet and also smart”), the wicked queen, “forest creatures fierce and wild,” a beguiled prince (and a huntsman), the magic mirror, and of course dwarves (numbering “six or seven, but maybe nine or else eleven”). The production will be directed by Christina LoBello and Brooke Ferguson. Both boys and girls between ages 6 and 9 are encouraged to audition. All levels of experience are welcome, and auditions are open to children from any town. No prepared monologue is required, but those auditioning will be asked to repeat lines or read from the play. To schedule an audition, call (860) 515-8115 or email auditions@nbyt.org. Pre-scheduled auditions are preferred, but walk-ins are welcome. Those cast will be asked to pay a participation fee of $60. No child or family, however, will be turned away for inability to pay, so please ask about financial assistance if necessary. Older children age 13 and up may also call with interest in stage crew and technical positions. Previous Previous post: A Look at 2013 at NBYT! NBYT THE TALE OF SNOW WHITE Next in Little Kids on Stage Series!